Who would have thought that a mare, destined for a dispersal sale, would end up the dam of a champion? 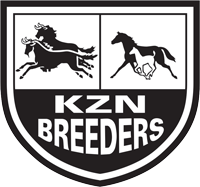 “Emperor’s Dance as a filly in training was with a top trainer in KZN but the trainer told the owner he didn’t think very much of her and that he should sell her at a dispersal sale,” recalls Cathy Martin, co-owner of Hadlow Stud. “It turned out to be a bad decision on their part. Romeo Francis bought her and she won her races with him. 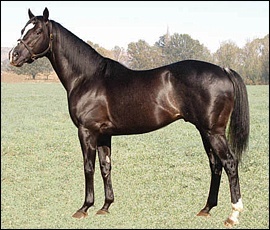 St John Gray, seeing her potential, bought her for stud and the rest, as they say, is history.” Emperor’s Dance is the dam of the mighty Dancewiththedevil. 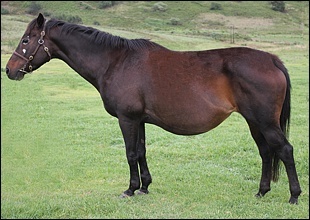 Owned by Graystone Stud she stands at Cathy and Jonathan’s Hadlow Stud in Mooi River. 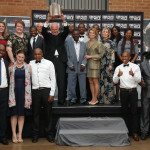 Dancewiththedevil, up to the 19 January, was current leading racehorse in South Africa, with earnings of R1 233 000 since the start of the season. The first things noticeable about Emperor’s Dance are the unusual white pigmentation markings on her face. She is not a very tall horse, but certainly has quality and strength and she is very reminiscent of her sire in her looks, Caesour. 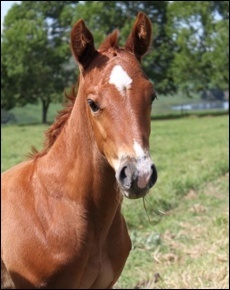 “She’s a very quiet, shy mare at stud, until she foals. Then you dare not put your head over the stable door!” explains Cathy. Caesour is currently lying eighth on the Broodmare Sires’ Log. He is also the only stallion in South Africa to have achieved three Grade 1 winning mares overseas, with four winning Graded events, including the likes of Irridescence, Perfect Promise, Dane Julia and Alexandra Rose. These total to six Grade 1 wins between them, and seven Grade 2/3 wins internationally. 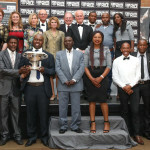 This is an incredible feat and its almost odd that Caesour stands for a fee of just R10 000. Out of Misty Dancing by Elliodor, Emperor’s Dance had three wins at the track and won R109 351. She placed three times including the Gardenia Handicap (Listed) from only 8 starts. She is the dam of 5 runners and three winners which include two full sisters namely Mumbai Magic and First Waltz, both by Announce. Cathy goes on to say: “The full sisters, Mumbai Magic and First Waltz are both back at stud here and we look forward to seeing their progeny on the racetrack soon. The 2006 filly she produced made her stand out from the rest. 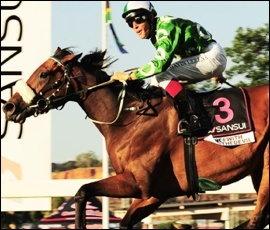 Dancewiththedevil, bred owned and trained by St John Gray, is by Modus Vivendi and was voted Equus Champion Older Filly/Mare in 2011 as well as KZN Breeders Award for Horse-Of-The-Year. She has had 8 wins to date and earned a total of R3, 253 425 in stakes from age 3 – 5. 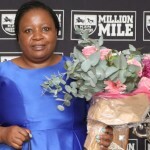 Her scintillating wins include the recent Summer Cup Grade 1, Gold Challenge Grade 1, Empress Club Stakes Grade 1, Horse Chestnut Stakes Grade 1 and the Acacia Handicap Grade 3 and she has placed 4 times including a second in the Joburg Spring F & M Challenge Grade 3. The dam of Emperor’s Dance is Misty Dancing, also a three time winner herself. She has had 8 runners and 4 winners, including being the dam of sire War Lord (by National Assembly). He is a five time winner including the Grade 2 Sentinel Sprint, and placing in the SA Nursery Grade 1, Gold Medallion Grade 1, Egoli Spring Grade 3 and the Tommy Hotspur Handicap Grade 3. Emperor’s Dance half-sisters include a two time winner called Colour Of Music, and a full sister called Artistry, herself a winner and placing 3 times from eight starts. The dam-line includes nine-time winner Modern Beat who went onto stud duty, as well as Smart As Paint, a Grade 1 winning filly and the dam of seven winners. The story of Emperor’s Dance proves that the potential for greatness should never be underestimated.